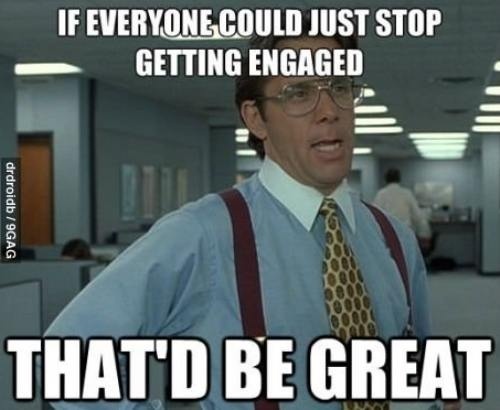 Put A Ring On It…Or… Forever Alone? Last Thursday I just happened to pick up CSU’s newspaper ‘The Collegian’ on my way to my 9:30 AM class. This was just plain out of the ordinary… I never read the paper. But on this certain day I decided to open it up and read through what ‘compelling’ news they had to report on. I opened up to the Opinion section on page 4 and immediately my eyes were drawn to this title, “Not having a ring by spring is okay”. Of course being the girl that I am I knew exactly what the topic of discussion was going to be… engagements and marriage. If you know me you would know that it would almost be a sin NOT to look at what the article had to say. This particular column began with a person who signed themselves off as ‘forever alone’ while asking the writer, “Rams’ Rede”, about whether or not marriage and relationships should be something they should be focused on in their final semester of college. Ending with the fact they are single and bothered by it, concluding with the already mentioned ‘forever alone’. First of all, facing the ‘facts’ that those in their early twenties don’t know what they want to do with their life professionally is a lie. That is not a fact. To a fault I am a planner. I have loved being able to sort through and, with the help of Our Lord, sort out what I would like to do professionally. I may be in the slim margin of people who are confident in their career at twenty one but I sure can attest to being a part of the few who know and are confident in their career pathway. Unfortunately, I feel like there’s some unwritten stigma that is telling people they should be ‘perfect’ before they meet the person they will marry. If that’s the truth? I would have never met the man I will eventually marry. I am no where NEAR perfection, but praise God I have someone who loves the imperfections in me so perfectly. I am growing in love, communion, and holiness with this amazing, yet also imperfect, man. Yes, I am a mess. I sometimes don’t have things figured out so perfectly in my personal life. That doesn’t make me any less apt to love, or him any less capable of receiving that love. What Rams’ Rede was doing was discounting the fact that people are fully capable of attaining true and lasting relationships in college. This doesn’t mean that every relationship is meant to be when you’re in college. There are definitely a few things that are essential for the relationship to last and if you would like a list of some tips on “how to survive the first year in a serious relationship” take a look here for some do’s and don’ts. The next fundamental thing that I took away in disagreement with this persons advice is that selflessness is required in any relationship. If you don’t believe me, take the time to read this. If Rams’ Rede considers themselves to be lucky to only think of themselves then quite honestly I don’t think they are ready for a serious relationship. Marriage will bring sacrifice but also immense joy. Especially in the creation of a new life. I wholeheartedly believe in what Rams’ Rede says in that, “There are people that want to graduate and have someone to face uncertainty with- an ‘us versus the rest of the world’ mentality”. I am that person. Not because I am afraid of the uncertainty or can’t handle the world on my own, but because as it is said in Song of Songs 3:4, “When I found the one whom my heart loves, I took hold of him and would not let him go”. I just can’t imagine not going through those big moments without him. It’s not easy. Love will never be easy whether you are old or young. The word “compatible” comes from the latin word “compati” which means to suffer with. To love someone is to suffer with them. Although decisions and the future are very overwhelming and scary… it’s an adventure that makes the immense sacrifices and suffering worth it. When I was younger I dreamed of adventure, but never imagined I would actually do adventurous things. I never imagined I would actually climb a mountain or try exotic food, but I did it! You want to know why? God gave me the person who brought the adventure out in me. I would not trade that for the world. I will gladly take all of the difficult moments if it meant I had just that one moment of adventure with the guy I love. It might be easier to think of only myself, but it doesn’t give me as much joy. Plus, I don’t doubt that God will give those who have faith in Him the grace to make these decisions with joy and excitement! For those of you that feel you are ‘forever alone’. You are not! My advice to you? Instead of saying that you should think only of yourself during this time, like Rams’ Rede suggested, I propose the opposite. Think of others, not just yourself. Be praying for your future spouse and asking God to give you the patience to wait for him. If you have Our Lord constantly on your heart and you are thinking of His will and His desires for you, it will make the time go by a lot faster. That is what I mean by not focusing so much on yourself, focus on Him who created you. Trust me, even when you have found ‘the one’ you will still see rings and hear wedding talk everywhere. 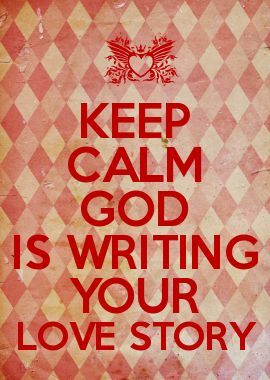 It is a beautiful thing to be in love but it is also beautiful to trust that God was the writer in your love story. Allow Him to be! Have the faith that He will bring the person into your life at the proper time and in the proper place!